I just returned home from a nice long vacation in London and the English countryside, and the food is still fresh in my mind. The flavor of those wonderful English sausages was intoxicating (they produce so many great varieties–one more delicious than the next). In addition, etched in my sense memory is a vegetable side dish I had at a fabulous restaurant in London, Scotts in Mayfair. 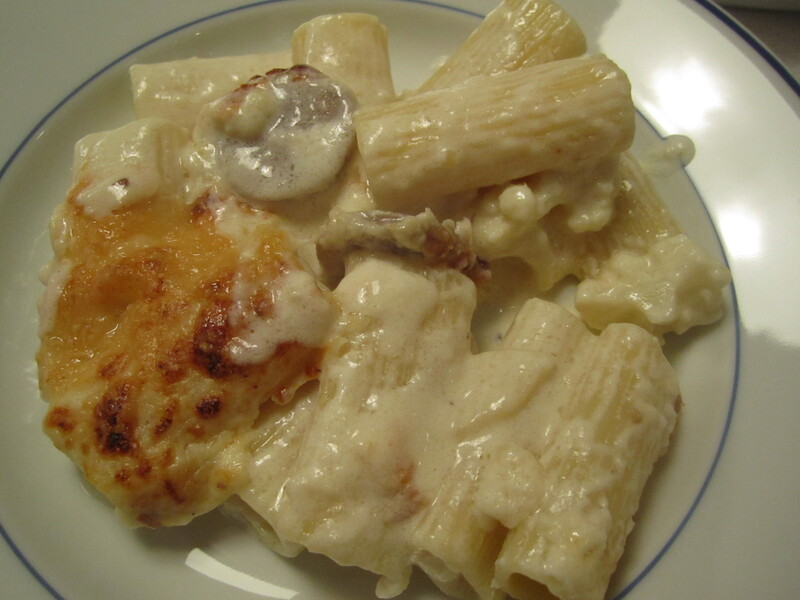 It was simply cauliflower, smothered in bechamel, topped with cheese, and baked until golden brown. I’m always looking for great vegetables when I dine at new restaurants, and this sounded (albeit a little rich) irresistable–and was. 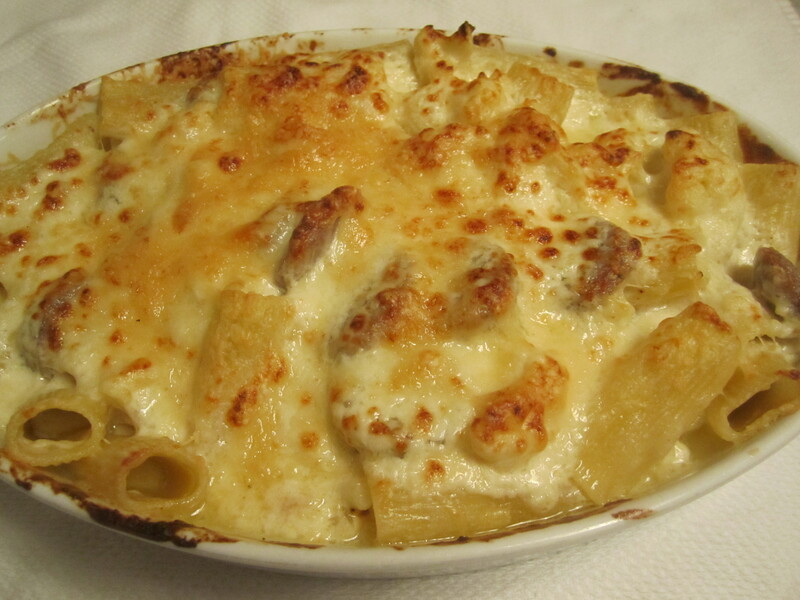 Although I don’t often cook with bechamel, in England, I was reminded of what a wonderful flavor conductor it can be for so many foods. You can just as easily call this mac and cheese, but whatever you choose to call it, its inspiration was decidedly British, it’s preparation was quick and easy. Because of the richness of the dish, all that is really necessary is a crisp green salad to accompany it. Your guests will absolutely swoon over this one. Bring pasta water to the boil. While waiting for water to boil, make bechamel. 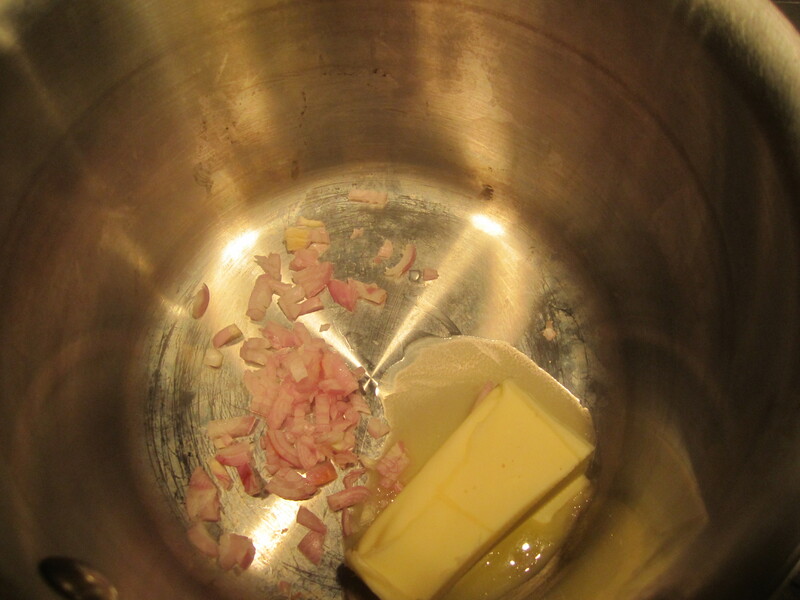 In a saucepot, melt butter and shallots and cook on low for about 5 minutes. Add in flour and stir to break up any clumps, while coating flour completely with butter. Stir and cook for about 4 minutes, just until the mixture begins to color (do not let it go beyond a pale yellow). Add in the half and half, along with nutmeg and a teaspoon of salt, and allow the mixture to come to a simmer. 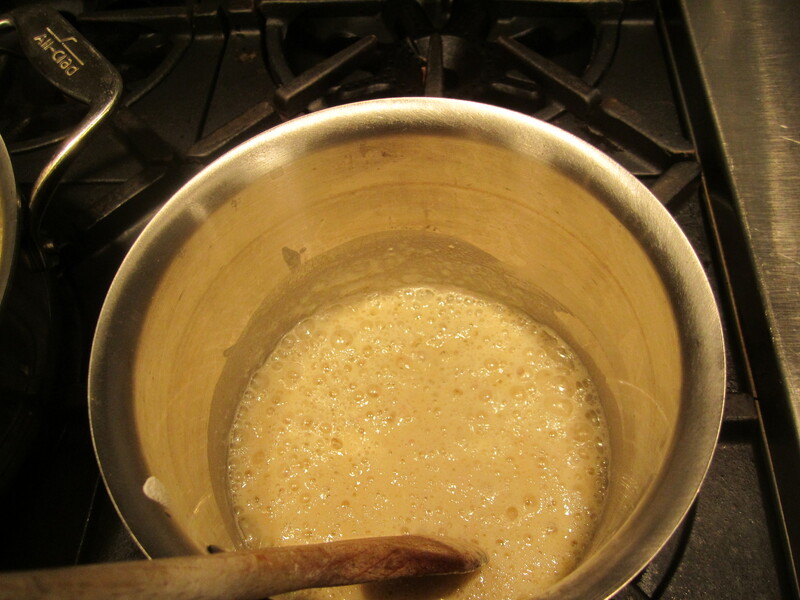 It will thicken as it simmers–you want it to be the consistency of very thick cream. 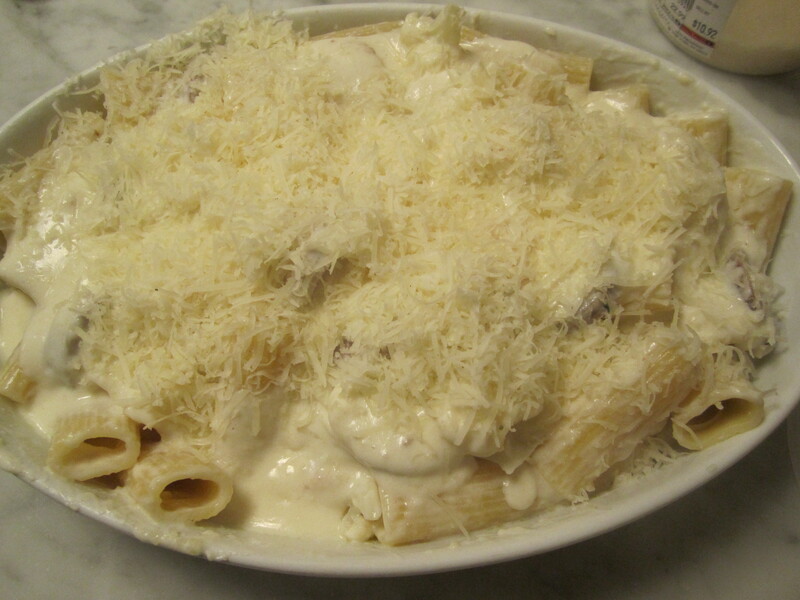 After it simmers for 2 – 3 minutes, turn off heat and add grated pecorino. Set sauce aside until pasta is cooked. To the boiling pasta water, add salt and cauliflower. 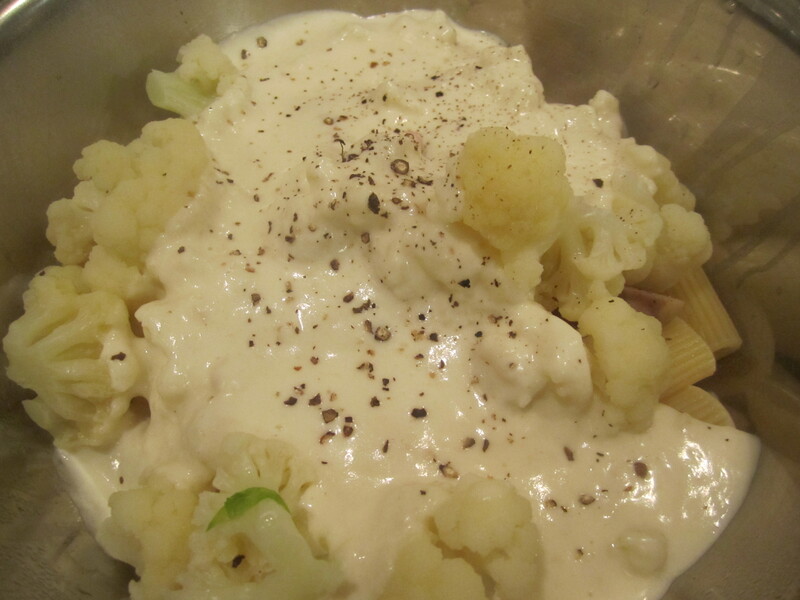 Blanch cauliflower for approximately 7 minutes, or until tender. Remove and drain. Cook pasta in same water until a minute shy of done. 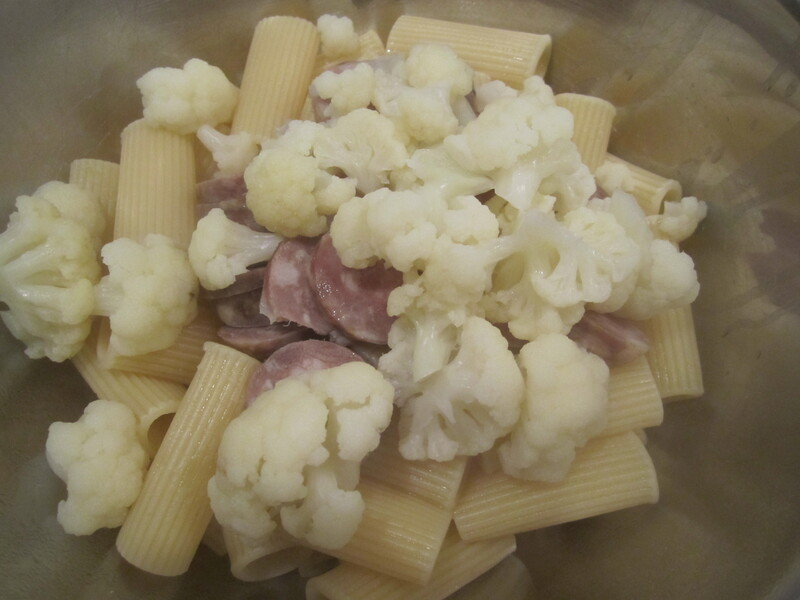 When pasta is ready, drain and combine with cauliflower and sausage in a mixing bowl. Add half of sauce to mixing bowl and stir to combine. Turn the mixture into a greased baking dish and top with the remaining bechamel, salt nd pepper to taste, along with all of the manchego. Place in preheated oven for about 10 minutes, or until bubbling. Turn on broiler to broiler to briefly brown the top. Be careful–it browns quickly. When uniformly browned and bubbly, serve immediately.